It’s springtime in Toronto and even though it isn’t all trees budding and flowers sprouting, it’s a little warmer and the sun is sticking around. The time has come for iced-coffees, opening your apartment windows, and actually being able to sit out on a patio and sip Caesars. 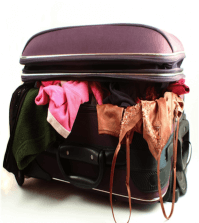 With this change of season also comes an inevitable change in your wardrobe, your makeup bag, and maybe even your perfume. A girl’s relationship with her perfume is a little bit of loyalty and a dash of risk. If you switch your winter makeup staples in favour of a new spring colour palette, why not your perfume? When I’m preparing for a fragrance change-especially if it’s changing with the seasons-I start by first going to my signature scents and picking out my favorite notes. I know that I tend to lean towards rose and fig, and it helps to know what you like when you are trying to shop for a new scent. The second thing I do is research. I like to look up reviews and blogs that detail any new fragrances I might have missed, so I can make a list of things I want to try. I may go on a perfume adventure around the city and spend my day trying to find the perfumes I want to try, or I try Lucky Scent or The Perfumed Court and order five or six samples and desperately await their arrival. It can take more than one spritz to know if you like a perfume, that’s why samples are so great! It’s always important to think out-of-the-box with fragrances. There are so many interesting small perfume companies and niche scents, that sticking to the ones from The Bay or Sephora may really limit your choices. I discovered my most loved scent, Egyptian Goddess by Auric Blends, at a natural foods store and in oil format! 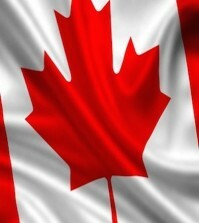 Now that we have the basics covered, we can talk about season. Let’s start with spring. In spring it’s great to opt for a fresh and airy scent that still has a little musk to it. Everything is new and fresh but still has that earthy undertone of regrowth. I hover towards Diptyque perfumes most often but Philosykos is a most-coveted spring scent. It’s fresh and musky, with notes of fig and a hint of warmth. Daisy by Marc Jacobs and Clinique Happy are two very loved spring scents! I find that in summer I want a really light perfume. Nothing heavy. Nothing too “perfumey”. I like solid perfume and oils in the summer because they work really well with your skin, especially if it’s sweltering. If you think about what the season represents to you then you’ll have an easy time picking a seasonal scent – I want the ocean and sand and coconut undertones! 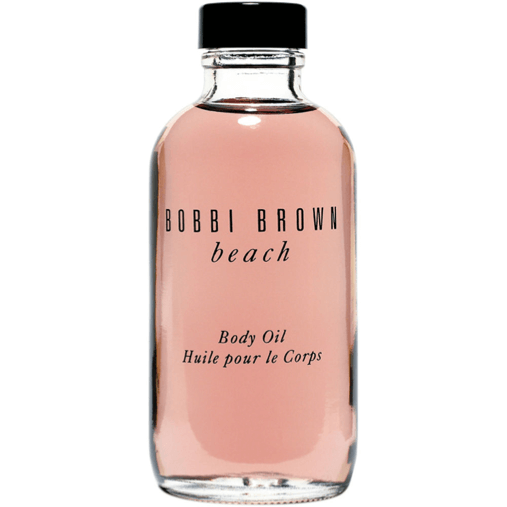 Bobbi Brown’s “Beach” body oil could be a winner for my summer fragrance. My autumn and winter scents are usually interchangeable. I find that when it’s colder it’s comforting to wear a heavier fragrance. In winter I might add a scented talcum power to layer with my perfume. Anything with woodsy undertones or cologne-like scents I die for in the autumn/winter. I may even steal a boyfriend’s cologne in the winter if a perfume won’t give me what I want. That’s why I love Diptyque’s 34 Boulevard Saint Germain – a deep woodsy unisex fragrance. 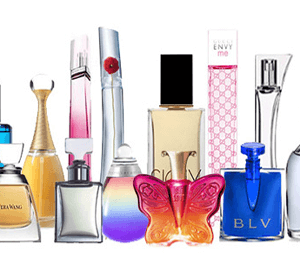 Overall picking a fragrance is a personal experience. If you want to start changing your fragrance with the seasons, you might have to “kiss a lot of frogs”. Decide what you like and then explore. If you don’t know what you like, discover it by testing and trying everything. 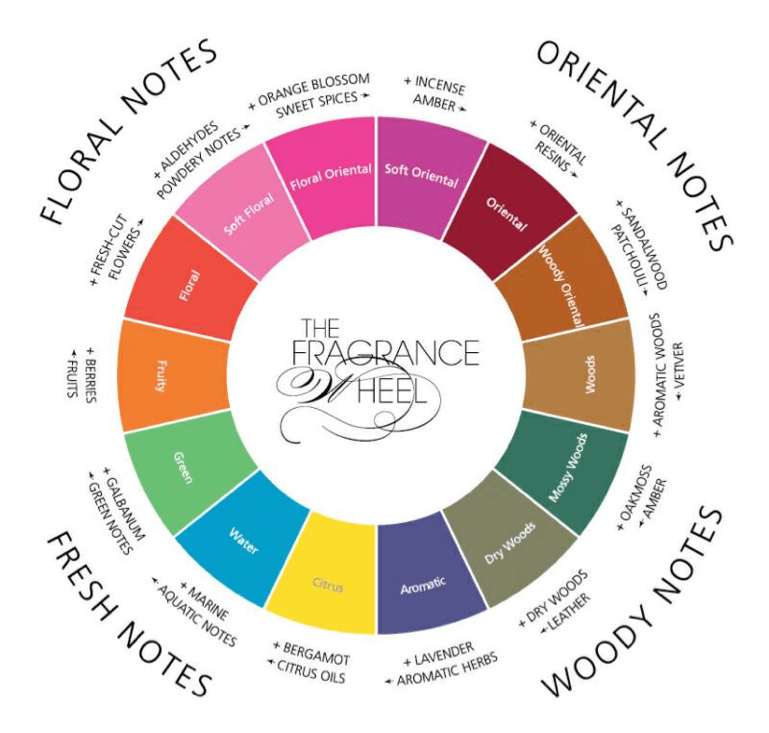 The fragrance wheel is super helpful if you are stuck on picking what notes or undertones you want in your new fragrance!